Daniel Chester French (born Exeter, New Hampshire, 1850; died Stockbridge, Massachusetts, October 7, 1931) was a famous American sculptor. His most famous works include the Minute Man statue in Concord, Massachusetts, and the seated Abraham Lincoln in the Lincoln Memorial. Children could learn more at: French. Children could view several of his artworks at: Met. Mary Hoffman (born England, 1945) has written over 90 books for children and teenagers. Her books include Troubador and The Falconer’s Knot. Children can visit her website at: Mary Hoffman. Joan Miro (born Barcelona, Spain, 1893; died Majorca, Spain, December 25, 1983) was a surrealistic painter. One of his famous works is Dutch Interior, painted in 1928. Children could view a number of his works at: Miro. 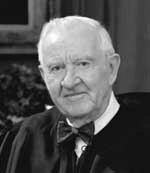 John Paul Stevens (born Chicago, Illinois, 1920) is a retired associate justice of the Supreme Court. He was nominated by Gerald Ford in 1975. He retired June 29, 2010. Idea: Children could research the process whereby a person becomes a Supreme Court justice. Is there a term limit for the justices? Should there be a term limit?